What is county lines exploitation? County lines is the police term for urban gangs supplying drugs to suburban areas and market and coastal towns using dedicated mobile phone lines or “deal lines”. The gang activity is highly associated with violence, drug dealing and exploitation; having a devastating impact on young people, vulnerable adults and local communities. Gangs will use children, and vulnerable people, to move drugs and money, criminally exploiting them (CCE); they will also seek to establish a base in target locations, typically taking over the homes of local vulnerable adults by force or coercion – this is referred to as ‘cuckooing’. Who is vulnerable to county lines exploitation? White British children being targeted as gangs perceive them more likely to evade police detection. There is increased use of social media to make initial contact with children and young people, ‘grooming’ them to become involved. Young people involved in county lines may exhibit some of the signs listed below, either as a member or as an associate of a gang dealing drugs. Any sudden changes in their lifestyle should be discussed with them. Any practitioner working with a young or vulnerable person they think may be at risk of county lines exploitation should follow their local safeguarding guidance and share this information with local authority social care services. The first step is usually to contact your designated safeguarding lead (DSL) within your organisation. If you don’t know who this is, refer to your manager. Your DSL has the responsibility for linking in with your local authority’s social care services. If you believe a person is in immediate risk of harm, you should contact police. 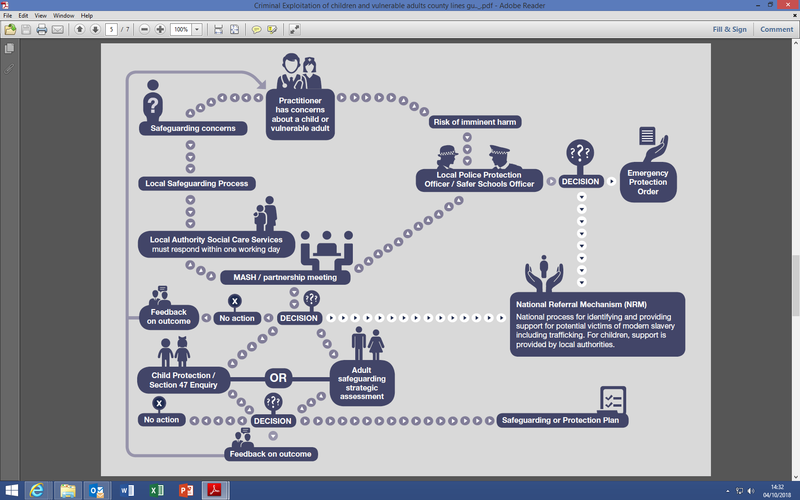 A flow chart is provided to outline processes to support decision making; this is available via the link button below. More information is provided by the Home Office, National Crime Agency and 4LSCBs in Hampshire, Portsmouth, Southampton & Isle of Wight to ensure that police, local authorities, education, health and other agencies work together and share a consistent approach to tackling these child protection issues. This is accessible via the relevant link buttons below.